Typo has so many unicorn themed pieces at the moment- although it’s important to remember that I liked unicorns before they were cool! I look forward to taking my unicorn water bottle to the pool and the rest will certainly brighten up the office. I couldn’t resist the flamingo notebook too. It says ‘Flock Yeah’ on the front. I might go back for the unicorn pencil sharpener, I’ll probably have the use for it since I occasionally do colouring in now. It was an inexpensive shopping trip that satisfied the urge for shopping. 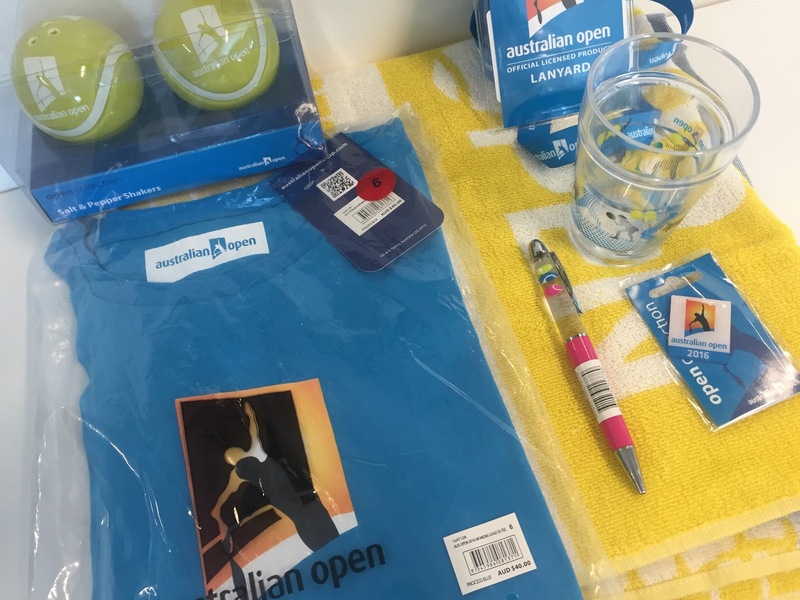 For the 15th year in a row I am completely loving the summer of tennis with the Australian Open and lead up tournaments. This year I decided to celebrate by purchasing some merchandise from the website. The item I’ve had the most use from is the players’ towel which I use every time I go to the pool. I have the rest of it at work but I’ll bring it all home after the tennis has finished- then the salt and pepper shakers will look so amazing in the house. My pictures are frequently used on Kitten D’Amour’s social media but this one excited me the most because it got over 1 000 likes (little things like this make me happy). Most of the posts on the page get less than 100 likes so I’m not too sure why mine was so popular- maybe because I’m standing on a beach. It’s all great fun. Remember to follow me on Instagram as chelsea_miracle. My life at the moment pretty much consists of swimming and not much else. Whenever I’m not at work, I’m almost always at the pool. Swimming has been so positive for me. It’s given me a life outside work when I decided I didn’t want work to be my whole life anymore. My background in swimming, despite having not trained or raced in twelve years, means I’m able to take it up again. I’m very grateful now for all the time and effort that was put into my swimming training as a child. Fortunately swimming as an adult is much better, there is less pressure and it is very social. It’s helped me so much. I mentioned this before but avoided writing about it in detail as it makes me too sad. The one person at my work who meant the world to me (and was my manager) has left today. I’ve had a really hard time dealing with it over the last five weeks since I found out. I can’t even put it into words how impacted I feel- I’ve cried a couple of times and thought about it continually. Last year was such a life changing time for me. I effectively got promoted , gained confidence and got my life back after so many years of struggles. I credit this all to one person for where I am today. He made every single day better for me. I think he’s perfect and everything I wish I can be one day. He gave me so many opportunities and responsibilities when many other people at my work thought I was young and inexperienced. He was always on my side continually believed in me. I’ve literally never met a nicer more accomplished person in my life. The level of admiration I have is beyond words. The point I’m making is that it’s rare to find someone who touches your life to this extent I feel awful about the whole situation. I have absolutely no doubt we will remain friends and be in regular contact, I’ve been provided with reassurance of that. However, it’s changed work for me. I used to be mega enthusiastic about my job, gave it my whole life last year and voluntarily did extra hours just because I felt so lucky to be there. But now all my motivation for the job is gone and I hate being at work. It reminds me of how sad I am and all the memories we shared together. I can’t force myself to feel differently right now. Work is now just something I have to do and nothing more. I struggle to get through the days because I’m upset being there. I’m trying to create more of a life outside of work to feel better and distracted which is a major factor behind me getting back into swimming. This beautiful cardigan is the newest addition to my wardrobe and it is right at the top with my favourites. It’s from an old Kitten D’Amour collection (Not In Kansas Anymore), before we even had the store in Sydney. 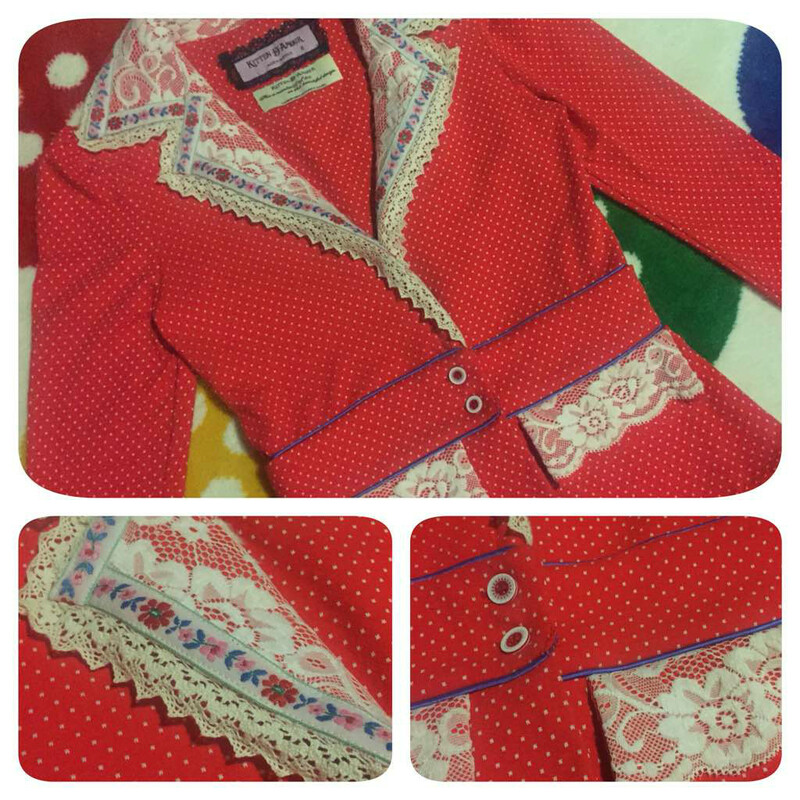 I’ve wanted it for ages and have been stalking eBay and the Facebook Buy Swap and Sell group for one in my size. I finally located it on the Facebook page and was so lucky to buy it because all the items usually go so fast. I’ve acquired three beautiful Kitten D’Amour pieces from The Buy Swap and Sell Group and it’s such a good way to exchange clothes. I can’t wait to wear this beauty for the first time soon. That cardigan is utterly glorious!! I'm not surprised why you wanted it so much. I wanr it too!!! Swimming is fab. I'm going in an hour with my friend N. I just wish I had your background in it. I can keep going and I enjoy it but I.have a poor technique and mostly just do slow breast stroke on the surface or under water. I'm so slow!! I can't even remember the last time I swam… Must have been years ago. I am not a good swimmer at all and I am just very awkward in the water. Good to hear you're enjoying it so much though! Congrats on your feature! You look beautiful! 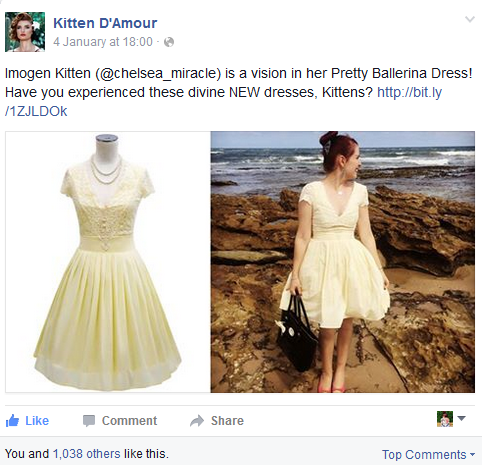 Congratulations on the Kitten D'Amour feature, Imogen – you look divine! Swimming has never been my strongest trait. I can swim but I can't float. Which means I don't swim in the deep end. OMG, I LOVE al those unicorn-themed items! 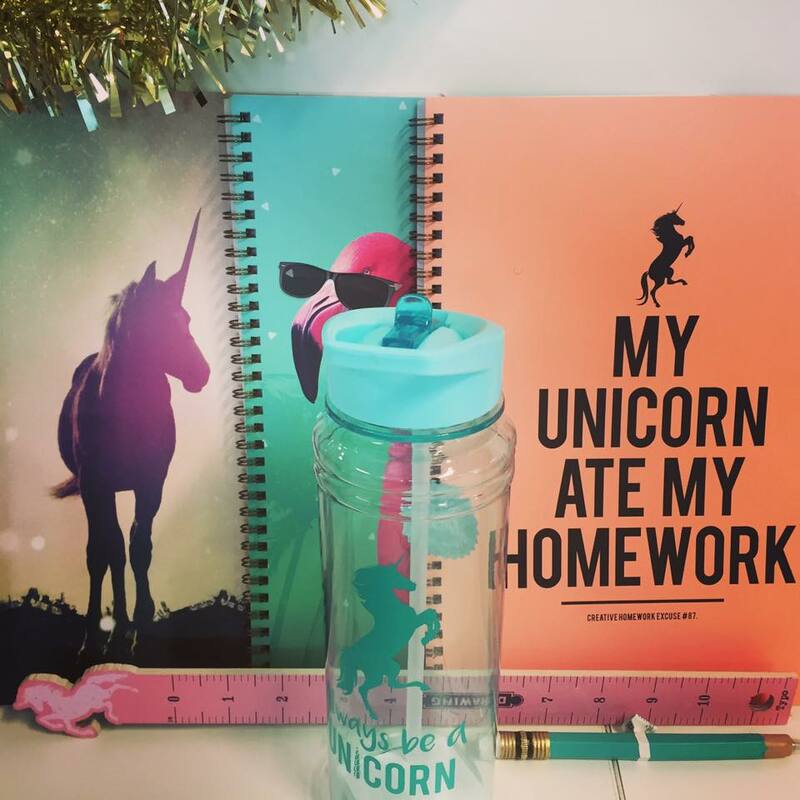 I'm loving the “My Unicorn Ate My Homework” cover on that notebook. Congratulations on getting so many likes on Kitten D'Amour's social media. Maybe if you sign up for Twitter you could use the name @Chelsea_Miracle there as well as on your Instagram. I hope that swimming helps get you completely healed up – I know it's wonderful four your health. So sorry to read that your manager mentor and friend at work left. That Kitten D'Amour cardigan is pretty. What Have I been up too? Watching too much NetFlix and being a recluse, hiding from the cold in the comfort of my home. It's mid-winter here in the NorthEastern U.S. – a warmer than usual winter so far, but still winter (brrr). I just love all the unicorn treasures, they're so cute! And that's so exciting about your instagram feature. It's such a lovely photo. Sorry to hear about your colleague leaving, I know it can be very hard when someone you are used to seeing every day suddenly isn't there anymore. But hopefully within time it will get easier, and your passion will begin to return. I think this photograph was very popular because you are a beauty! Great post…I always had a thing for unicorns myself, ever since I was a little girl. I must agree, unicorns are awesome! You look beautiful in that dress, and I love your unicorn finds! I am in LOVE with unicorns! “My Unicorn ate my homework” is so funny!!! Great , I love swimming!!! Hola guapa..te acabo de conocer¿quieres que nos sigamos por gfc? me encantaria. Swimming sounds like such a great thing for you. Fun snaps and catch up post! I love the red cardigan. It's super cute. yay for swimming and that red cardigan is adorable! I'm sorry your friend is leaving at work, it's difficult to lose a friend from your daily life and one who had championed you. I'm happy to hear about the swimming I need something like this… right now I have work where I'm not very happy and home. Once the weather is better I plan to get back to my walking. Aw. Too bad your friend is leaving. Well, more growth for everyone I guess. Congrats on the feature! Love that red jacket. 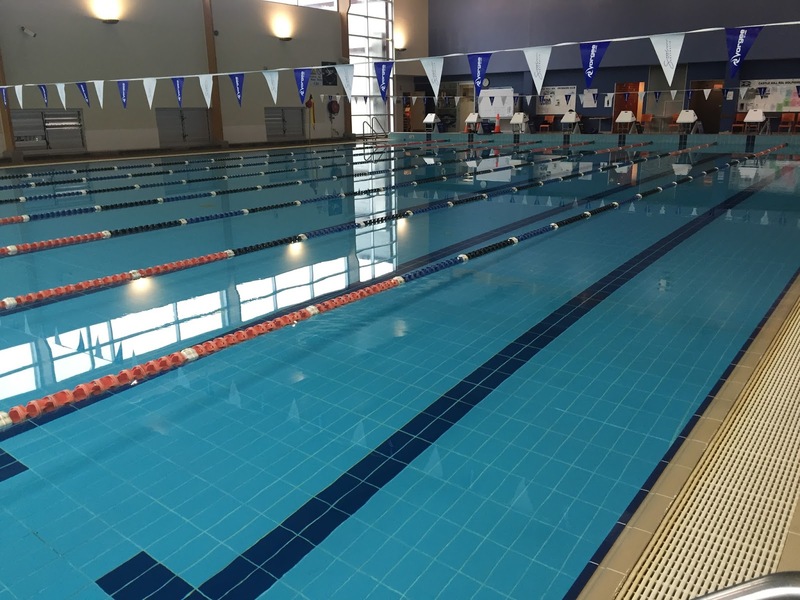 Loved reading this post, I also love swimming! These are so adorable! Love the bottle! And that cardigan is totally you!! I'm sorry to hear about you losing your friend and mentor at work. I hope things will feel more positive there again after a while. I'm sure it will! I will just take time. In the mean time that's great that you are filling the rest of your life with things you love that make you happy!